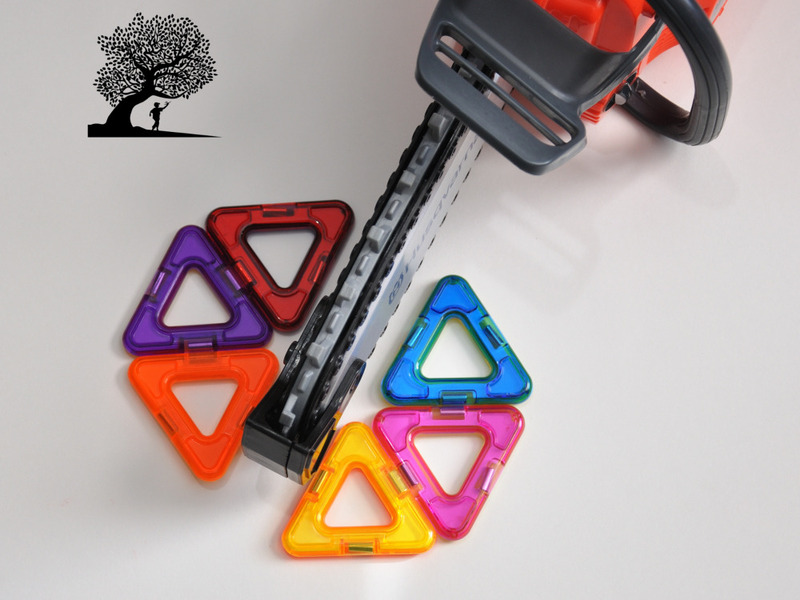 Are you tired of toys that your kids play with a few times and then practically discard? Wish you had more ways to teach your kids while they play? Whether you recently bought a set of magnetic tiles after hearing about how much fun they are for your children, or you’re still considering a purchase, we’ll give you some great educational ideas using magnetic tiles that you can use to send your kids to the head of the class. 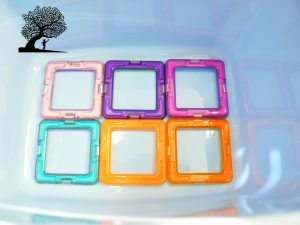 Whether you are a teacher, parent or someone who is constantly interacting with children, you can easily work these educational activities using magnetic tiles into your kids’ play time. 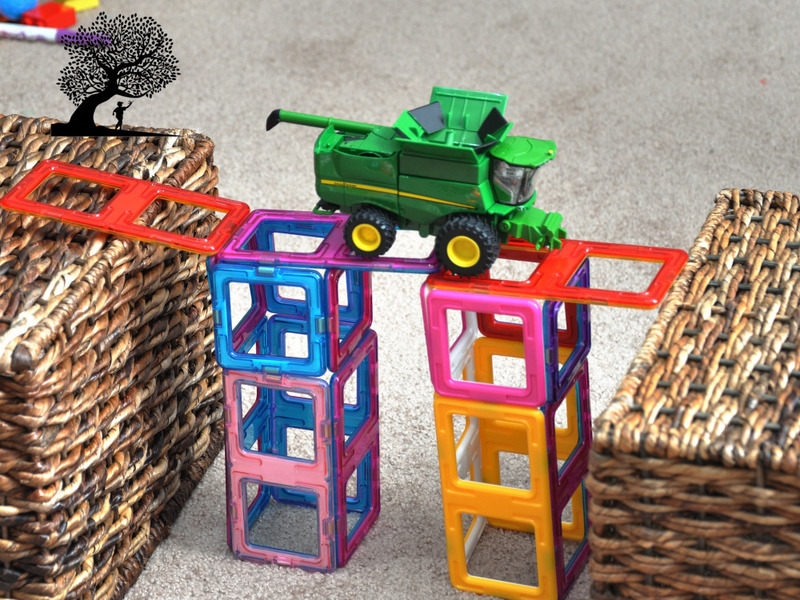 From a parent’s perspective the Magical Magnetic Building Tiles and Blocks from A Mustard Seed Toys are safer than many other types of construction toys because there are no small pieces or connectors for younger siblings or pets to swallow or to get chewed up by the vacuum. 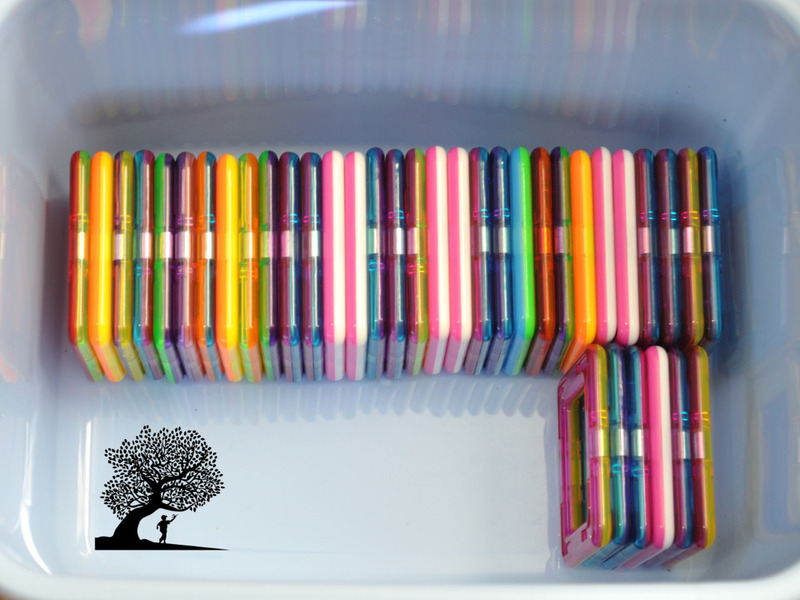 Their bright colors and the fact that they stick together also make them easier to keep track of and to store. As you can see from the list above, there are a number of ways you can use any or all of the sets to increase your child’s fine motor skills, their math skills, comprehension skills, and increase their level of creativity. The only problem you should have with the list is trying to decide which activity to do first. Teaching children about symmetry can be a challenge if you lack the right materials, skills or both. Magnetic tiles can make that job easier and fun for you and your kids! This great idea comes from And Next Comes L.
The best tool to use is a mirror. But, you could also use other reflective surfaces using some aluminum foil on poster board to explore how the image changes when the surface changes shape. Create half of a rectangle or star and ask your kids to guess what shape it will be when you put it next to the mirror. Place it next to the mirror. The combination of the half-star formed and the reflected image will make up a full star. You can form other patterns, shapes or objects with this same procedure and ask your kids what they see. If you pick up one of our assorted magnetic tile sets, you’ll get tiles with a different color on each side of the tiles. So, even our smallest set with 20 tiles will have a large variety of colors. The bright colors make it easy to distinguish between red, orange, green, blue, and so on. How do you make it interesting? That way, they’re learning and having a great time! OK, so this is pretty obvious too. But, learning shapes is a great activity for your preschooler. And, you can start with 2D shapes and graduate to 3D shapes like pyramids and cubes as their confidence builds. The best part about this one is that it’s easy to do on the refrigerator while you’re working on fixing a meal. Talk about the different types of triangles like equilateral triangles with sides of the same length or explain how isosceles triangles have two longer sides. You can even introduce the concepts of angles and talk about right angles in squares and how all of the interior angles of a triangle add up to 180 degrees. Instead of just asking your kids to build a particular shape, you could make things a little harder by specifying the colors or numbers of shapes that they use to do it. The easy-to-handle shape and size of the tiles makes it easy for early-learners to move from one place to another as they learn to count. Once they master counting, you can start to ask them to add and subtract numbers by taking shapes away and counting them again or counting backwards. This is great for visual learners and before long it will be automatic! You may want to save this one until it’s time to clean up! The VERY BEST thing about magnetic tiles for a mom (OK . . . second to how much your kids will love playing with them) is that they are so easy to clean up. No more destroying your fingernails trying to take apart Legos and put them away! For sorting, have your kids build a huge building with all of their tiles and then tear it down with an excavator or a wrecking ball (I’m sure they will be glad to volunteer to be the wrecking ball). Then, have them sort and stack each shape that they have. Then, once you have nice and neat stacks of tiles you can put them away easily! Playing with magnetic tiles is a great way for children to learn the concepts of patterns without realizing they are ‘in the classroom’. By sorting the color or shape they need to accomplish their objective (building a boat, for example), they are learning how and why sorting is sometimes necessary. You can teach them to create patterns during playtime and to recognize patterns by having them continue the ones you start. 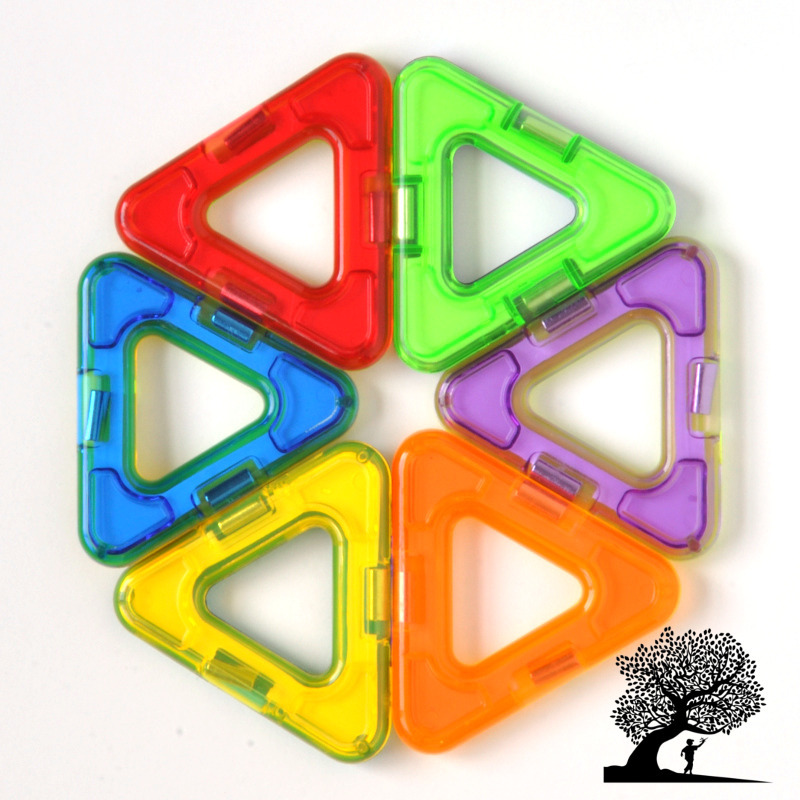 For younger kids, alternating either a color or a shape will be the best way to start. 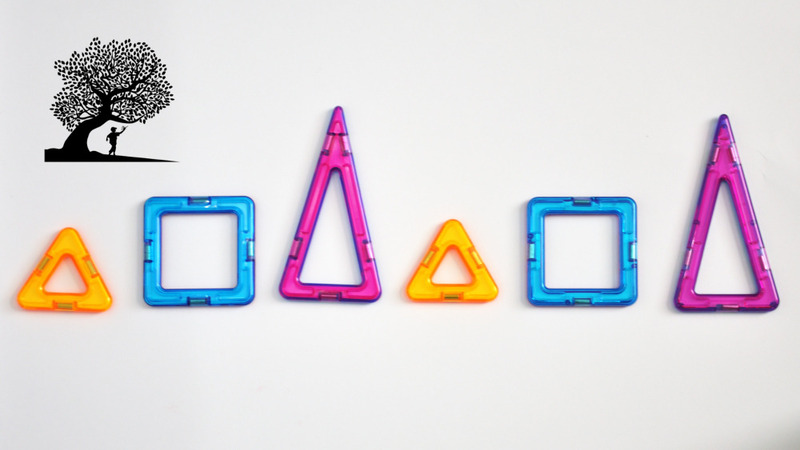 As they get better, you can alternate shapes and colors like red square – yellow triangle – _______ – yellow triangle. For your pre-kindergarten kids, you can begin to do even longer patterns that repeat every 4 or 5 tiles instead of every 2. 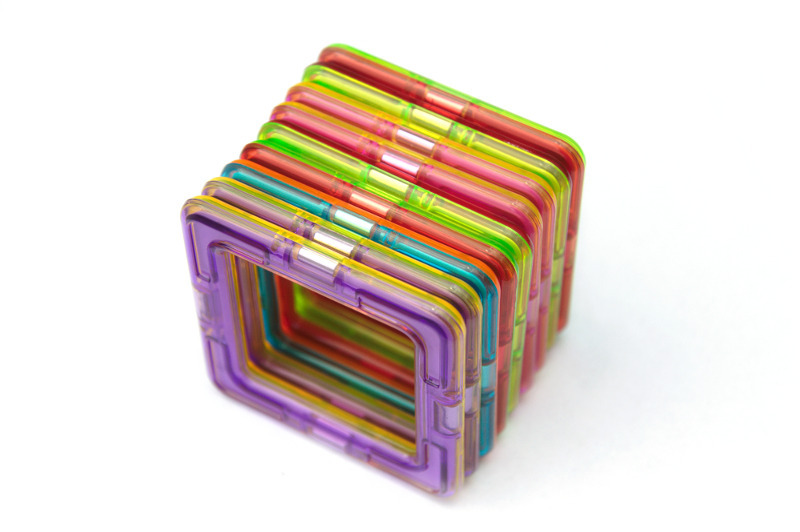 With a large set of magnetic tiles, you can construct nearly any fraction puzzle you can think of. With my kids, I used a set of 6 triangles to create a hexagon. From there, you can ask them to split the hexagon in half and work in the concepts of subtraction and division too. Or, create a square made from square pieces and ask them to remove 1/4 of the square. If you have boys that love tools, have them use a saw to “cut” the shapes apart. Or, let your kids use a toy knife to cut out a piece of the pie. While your kids have been playing, they may not have stopped to wonder why their tiles stick together so well. So, encourage their creativity by explaining about magnetic poles and how opposites attract. 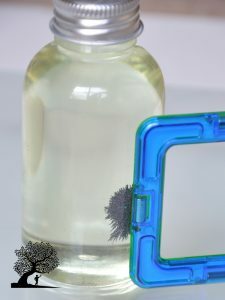 Then, have them explore how much weight they can lift using the magnets and how introducing a third magnet can actually weaken the bond between two magnets. Or, you could bring the magnetic materials to them! 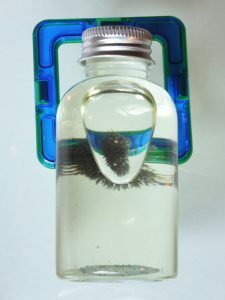 First, use a file and a piece of iron (check the magnetism with a magnet to be sure) to create a small pile of iron filings. Then, fill a small, clear bottle with a clear oil and pour the iron filings inside. Katie at Preschool Innovations suggests super gluing the cap closed to avoid a mess, not a bad idea! Your kids will love exploring how the filings react to the magnets and controlling where they go! It’s really cool how the filings align along the magnetic field lines going away from the magnet. 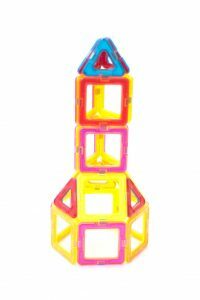 Now you can certainly teach your kids about gravity when they are using magnets to lift paper clips and other objects. But, you can also talk about it when building towers and describing why they are so prone to falling down when you build them! Make it really interesting by building a ramp out of magnetic tiles with the plastic inserts in the middle. Then, set a toy car at the top and explain how gravity makes it accelerate as it races to the bottom. If you have older kids, you can even have them calculate the speed at the bottom of the ramp based on the acceleration due to gravity! Now this is why even older kids can have fun with magnetic tiles! Have your kids explore pictures of buildings and try to recreate them using magnetic tiles. Then, explain how shapes like arches and triangles bear the weight of the building and transfer the load to the ground. After their lesson, have them build the building that will hold the most weight. After they finish, test the building by placing balls or people on the top. Or, have them try to build the tallest tower. As they build, have them think about what could be done to make the tower more stable. Next, get two cardboard boxes and have them try to build the longest bridge across the opening between them by using support structures at intervals to bear the weight of the bridge and the cars that will drive across it. There are few skills more valuable in life than knowing how to break down a large problem into smaller, more manageable tasks with problem solving skills. Thankfully, that’s yet another skill that can be developed using magnetic tiles! Of course, many of the previous activities will also develop problem solving in your kids, but I know with my kids, more variety always helps to keep them engaged. I’ll call it “Pack the Box”. First, get a small cardboard box (you may want to cut the flaps off of the lid to make it easier to work in). 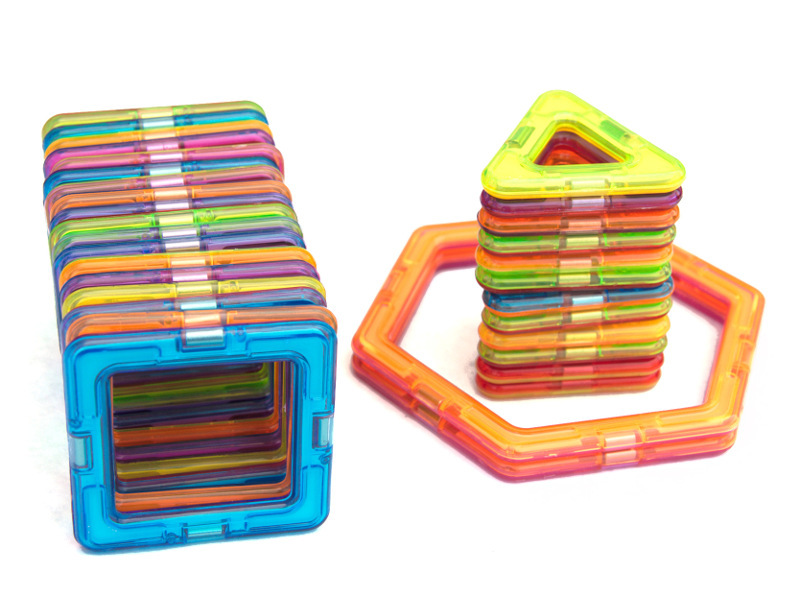 Then, grab a pile of magnetic tiles and ask your kids to see who can pack the most tiles in the bottom of the box without stacking the tiles on top of one another. They’ll have to carefully arrange the shapes to fit together to get as many tiles in the bottom as possible! At first, they may incorrectly pick up larger tiles (see my kid’s first try above), but it’s OK to let them finish and ask if they can improve. Next time, hopefully they’ll get a little better like attempt #2 below. 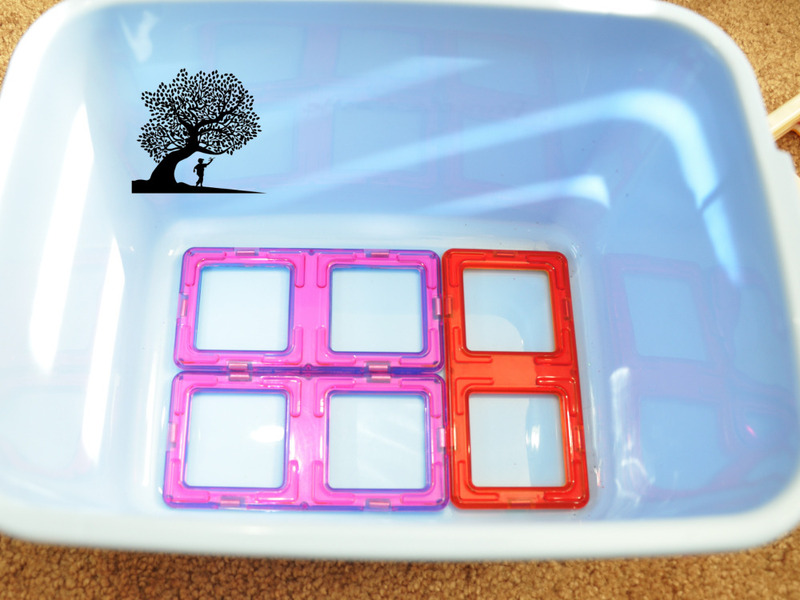 Try #2 with squares instead of rectangles! After they finish the game, stand the tiles up vertically and pack them into the box. Explain how you followed the rule of not stacking the tiles on top of each other and still accomplished the goal of fitting the most tiles into the box! This is a great chance to help them understand how to think creatively about a problem. If they’re really creative thinkers, maybe your kids figured out the secret before you gave them a hint! Next, we’ll be using one of your kid’s favorite stories! First, read them a page or scene from their story. Then, have them recreate the scene using their magnetic tiles. They could build Little Blue truck and the big yellow dump truck or a Big Red Barn. 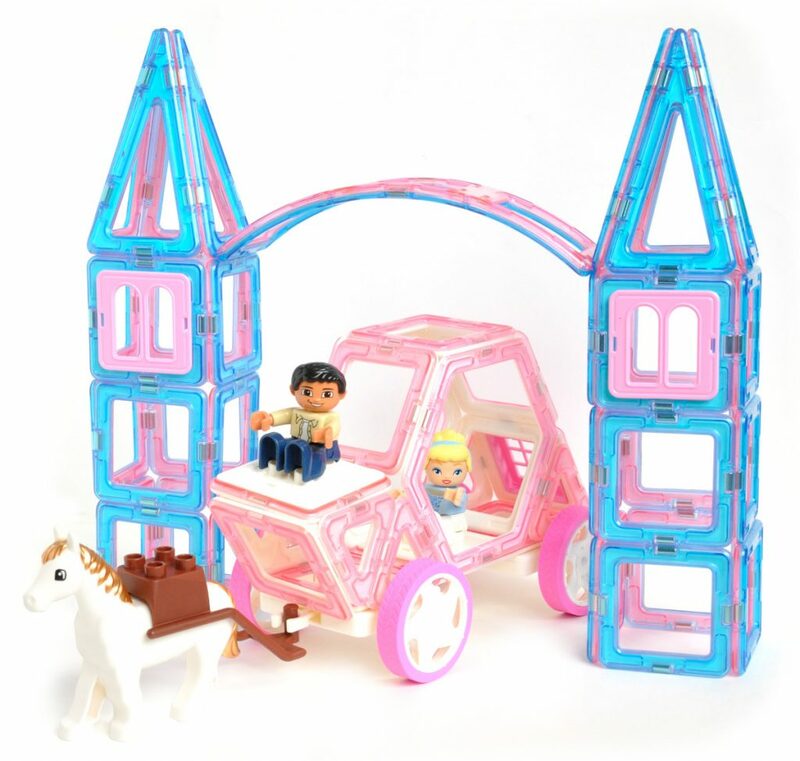 Use some of our sets with prince and princesses so that they can recreate Rapunzel’s Tower or Cinderella’s carriage. To step the difficulty up a bit, give your kids a word and challenge them to be creative and construct a scenario that uses it. This really solidifies the concept in their minds. This next activity is a great one for cooperative play and listening. First, set up a piece of cardboard or a box between your kids so they can’t see each other’s work area. Then, have the first child build a structure or shape and describe what they are doing as they build. The second kid’s job is to follow the directions precisely and build the same exact thing. At the end, remove the barrier for the big reveal and ask them to compare the two shapes. What are the differences in the structures? What was the hardest part about following the directions? What was difficult about giving the instructions? What could the first child have done to better describe the building? Before getting started, teach your kids new words like vertical, horizontal, above, under, and across and ask them to use the new words in their instructions. Also, let them swap places and experience both roles to understand what their partner was going through. For this next activity, we’ll be learning about design and encouraging creativity. First, get crayons and paper for your kids. Then, split them into 2 groups, designers and builders. The first group will get 5 minutes to imagine and draw plans for a building, bridge, or animals using the materials they have available (in this case, the numbers and shapes of magnetic tiles that are available). After finishing, the second group gets 5 minutes to try to build the object based on the design. Compare the plan to the building. Are there differences? Was it hard to make the plans? What was hard about following the design? Is there something that would have made the plans easier to build? Ask the designers if the building turned out just like they planned. This is another fun one! It’s a Daniel Tiger / Emoji mashup. For fun, instead of telling them the emotion, build it instead! Then, have them guess and then act out the emotion instead of telling you. 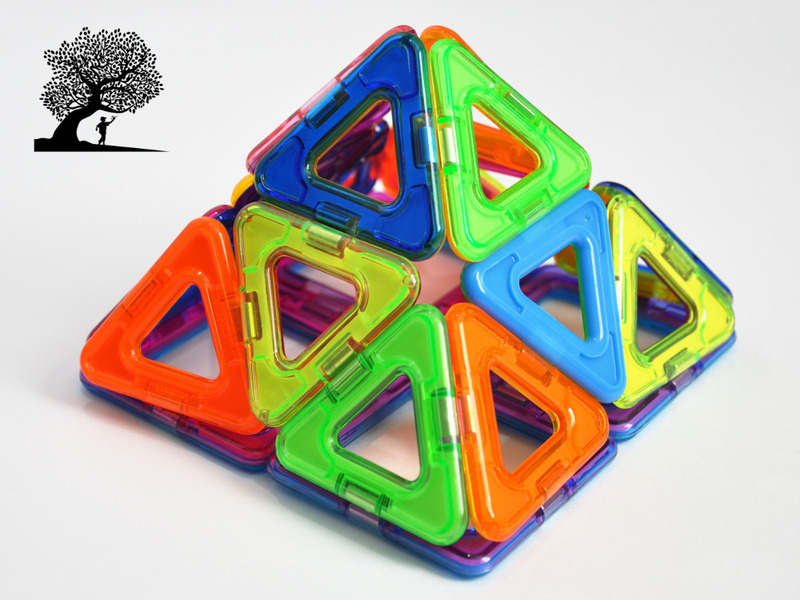 Giving your children magnetic tiles and blocks from A Mustard Seed Toys will also give another child a chance to experience the same enjoyment from the very same toy. That’s because for every toy A Mustard Seed Toys sells, the duplicate toy is donated to a child who would not otherwise have a toy of their own. Thanks for stopping by and I hope you and your child enjoy having fun with these amazing magnetic toys.